The whisper-soft glow of misty pearls in blue-gray is combined with earthy tones in brown and shimmering peridot stones on this charm bracelet and earring set. This bracelet and earring set was a joy to create. When I was growing up, I loved visiting the ocean and did so as often as I possibly could. This bracelet was created through the memory of those beloved trips where sea and sand meet sky. Not only that but when wearing this bracelet, the movement of the beads makes a unique sound that is reminiscent of the rush of waves on the shore. 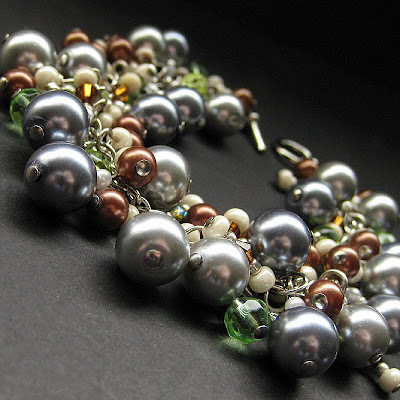 This unique OOAK (One of a Kind) hand crafted pearl and peridot bracelet is filled with a cascade of seaside colors, combining the beauty of misty seaside mornings with the shades of earthy sand and seaweed in a bracelet filled to overflow with clusters of glass and pearl beads on a silver plated chain. The entire piece is then finished off with a silver plated toggle clasp and comes with a perfectly dancing dangle of matching 1.5-inch (4 cm) length earrings. The bracelet measures 7.5" (19.5 cm) in length, which is a bit small for some wrists, but I am happy to adjust the length at no extra charge to make sure it's a perfect fit for anyone.